If you’re serious about growing your blog and creating a strong design, move setting goals to the top of your blog design to-do list. Think of them as the skeleton of your blog. From design to navigation to content, every decision you make about your blog should move you toward putting meat on that skeleton’s bones. Without goals, you might find yourself veering off track with your blog design. Sure, your design may look nice, but it might not mesh with what you want to accomplish in your blogging. And if you weren’t blogging to accomplish something, you probably wouldn’t have invested in this book to improve your blog design. Specific: Say exactly what you’re looking to achieve. Generic goals may be easy to think up, but they don’t move you toward an achievable goal in the same way specific goals do. “I want to make money blogging” isn’t specific enough. “I want to earn $500 a month through advertising” is specific. Measurable: Quantify your goal with numbers. Say you gained 500 e-mail subscribers last year. That’s less than 50 per month. So, shoot for 75 new subscribers a month. Or 100. Just try not to fall into the trap about obsessing about numbers. Other measurables you can strive for could be publishing three times per week, increasing subscribers by 30 percent, or earning a certain amount of money from blogging. Actionable: When setting goals, stick with action words. Even better? Imperative verbs. Start your goals with words like increase, create, and grow. All these cut to the chase, driving action on your part. Realistic: Being realistic means setting goals that are challenging but doable. Also avoid claiming that you want to be the best, funniest, and so on. There are plenty of steps you’ll need to take to get to the best — so make those your goals. Try not to make your goals too difficult or too easy. If you aren’t sure whether your goal is realistic, you can always adjust it later. Timely: Add timeframes to your goals. To start writing out your goals, think about your blog’s bigger purpose as well as more specific things you want to accomplish. Then brainstorm goals that can help you meet that ultimate achievement, select the most burning ideas, and then start adding measurements and timeframes. How many goals you create really depends on you. Too many can overwhelm you, but too few can make achieving them too easy. Start with two to five goals and then adjust if you need. Set a reminder on your phone or calendar to review your goals at regular intervals. Blogs change over time, and you might need to rearrange your blog design layout to help meet those goals. After you write out your goals, put them in a place where you see them often — whether that means you type them on a desktop sticky note or scribble them on a real sticky note. Keep your goals top of mind because they form the basis for many decisions about where to place your design elements. The ways that design can support your goals may surprise you. As you build your blog design, take a look at your goals and think about how elements of your design, layout, and navigation can be used to meet your goals. Promote your e-mail offering in a conspicuous space on your home page. Create an e-mail subscriber box that asks only for an e-mail address instead of a first and last name plus an e-mail address. This would make subscribing as easy as possible. Place a subscription box elsewhere on your blog. Perhaps you add the subscription box at the bottom of each blog post, to your About page, or in your footer. Carrie with Children is an example of how to adjust your design layout if one of your goals is to bring awareness to a certain topic. 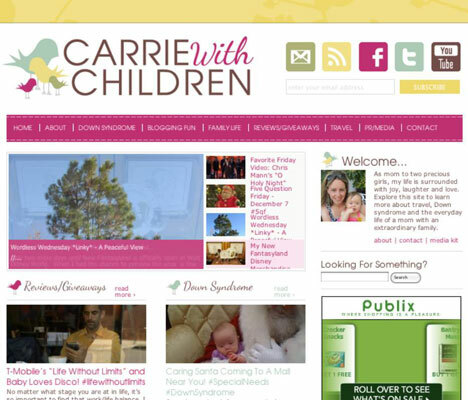 Carrie writes about many topics but wants to give special attention to Down syndrome. To do that, she includes a Down Syndrome tab to the right of the popular About tab and features a separate section for Down Syndrome posts prominently on her home page.